Hynek Kmonicek, Czech Republic Ambassador to the United States, announced the Minister of Foreign Affairs, Lubomir Zaoralek, approved the provision of five million Czech Crowns ($237,437) for humanitarian assistance to displaced families in La Grange, Texas in response to Hurricane Harvey. Brian Vanicek, Honorary Consul to the Czech Republic for Texas, notified La Grange officials of this donation that is intended for the basic needs of people displaced by Hurricane Harvey such as: shelter, food, water, health and hygiene needs. 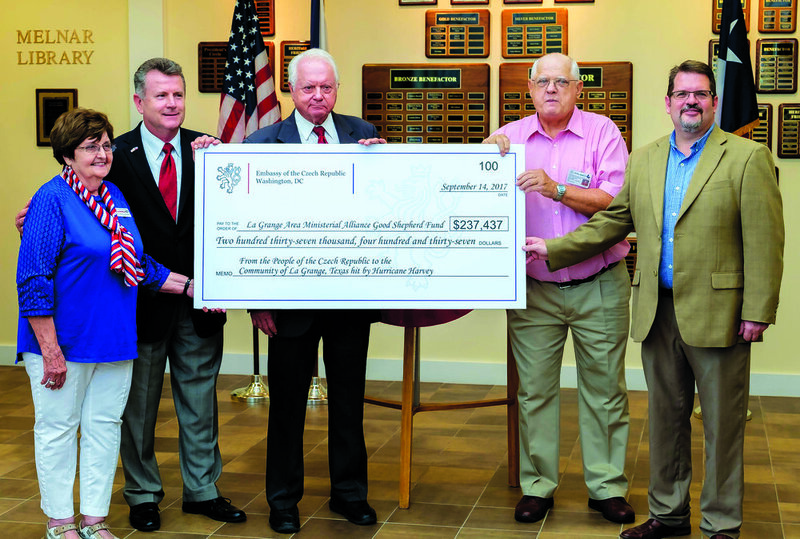 Mr. Vanicek presented the donation to La Grange during a public ceremony at the Texas Czech Heritage and Cultural Center on Friday, September 15 where Judge Edward Janecka accepted the award on behalf of La Grange. Hurricane Harvey caused devastating floods in the State of Texas during the last week of August, leading to loss of life and temporary displacement of millions of people, including Czech compatriots. The hurricane and resulting floods also had a severe impact on the infrastructure and environment. The donation presented by Vanicek represents the Czech Republic’s dedication and solidarity with the United States, and the Czech compatriots living in La Grange during the disaster. Brian Vanicek, Honorary Consul General to the Czech Republic for the State of Texas (second from left) presented a check for $237,437 from the Czech Republic to help La Grange citizens recover from flooding caused by Hurricane Harvey. Accepting the very generous donation at TCHCC on Fri., Sept. 15 were (l-r) Retta Chandler, TCHCC President; Ed Janecka, Fayette Co. Judge; John J. Cernosek, Mayor Pro Tem of La Grange; and Jonathon Smith, Adm of Good Shepherd's Fund.